Last weekend a friend took Betsy and I out to Dim Sum and then we went hunting for a good Asian market in the Denver area. I love Asian markets so much just because of the wide variety of stuff you can find there. The same ingredients also tend to be much cheaper than at a normal American grocery store. While we were wondering around we noticed these huge bags of lychee fruits for just a few bucks. There must have been 100 fruits in each bag. I couldn’t help myself and grabbed a bag of them. I really didn’t know what I was going to do with the little guys because I had never used them before, but I figured I could find something fun. Betsy and I ended up just eating most of them as a quick snack, but I saved a few to make this delicious Lychee Martini. A surprisingly simple and completely delicious recipe for a fresh Lychee Martini. The hardest thing about it is finding fresh lychees! 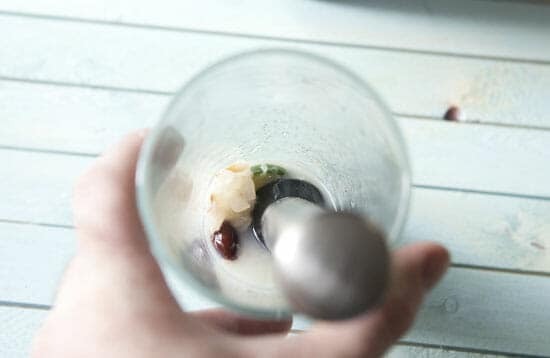 1) Peel lychee fruits and add three to the bottom of a mixing glass. Also add 1/4 of a lime. 2) Muddle the fruit and lime together for a few seconds, then add honey, and continue to muddle until fruit is completely mashed. 3) Chill your glass with ice and water. 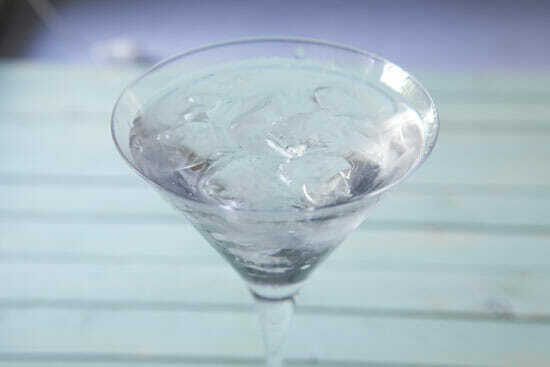 4) Add gin or vodka to the mixing glass with muddled ingredients and ice. Shake well. 5) Strain into chilled martini glass and garnish with 1-2 seeded lychee fruits. 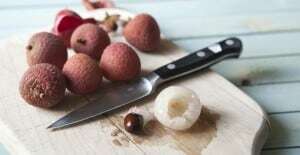 You probably won’t be able to find fresh lychee unless you have access to an Asian grocery store. I’ve never seen them in a regular store, but you might get lucky. They also sell canned lychee which would work okay for the martini but don’t have quite the flavor of the fresh ones. These little fruits look a bit intimidating, but they are actually easy to deal with. Take a good sharp paring knife and cut into the fruit up near the stem. The outer skin is pretty tough, but will cut easily once you get it started. Then just cut a little circle out of the top of the fruit, exposing the white fruit flesh. Then for the fun part! You can literally just squeeze the fruit out of the skin. It should pop right out. Then you’ll be left with a perfect orb of deliciousness. 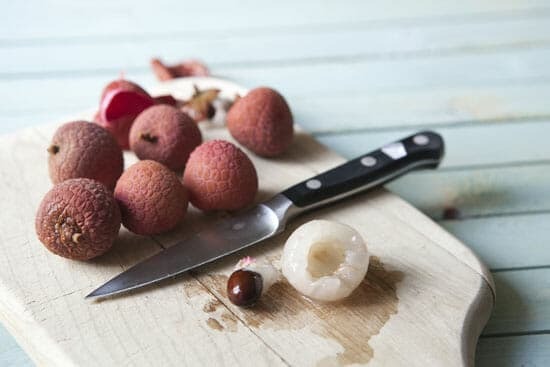 You can absolutely just pop the fruit in your mouth at this point like a cherry, but lychee do have a pretty substantial seed in the middle. 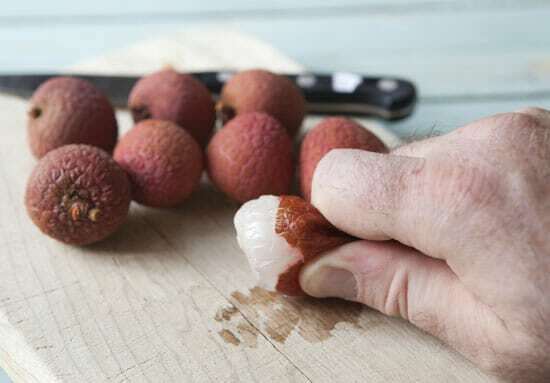 If you want to go a step further, you can carefully cut the seed out of the fruit, leaving the hollow lychee. 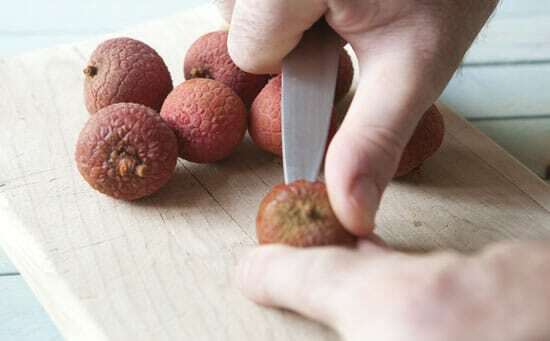 I like to do this step for the Lychee Martini garnish, but that’s it. 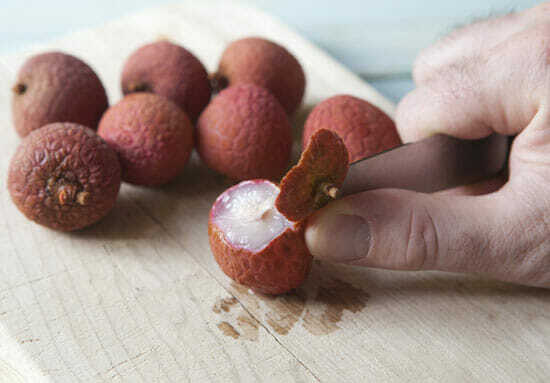 Once you have a few lychee peeled, you can make your Lychee Martini. As always, the most important part to any good martini is making sure you have an ice cold glass! So chill down your glass with some ice water before you get started. Add about 3 peeled lychee to a mixing glass with a big chunk of a lime and start muddling everything together. This will release the juices from the fruit and mix it with the fresh lime juice. Then add in your honey, gin or vodka, and a good amount of ice. I like gin with mine, but if you want a cleaner lychee flavor then vodka is the way to go. Shake this all up so everything is nice and cold. Strain this into your chilled martini glass, garnish it with a lychee or two, and you’re ready to rock! This is a perfect summer martini. It has a really clean, refreshing flavor and isn’t too heavy. 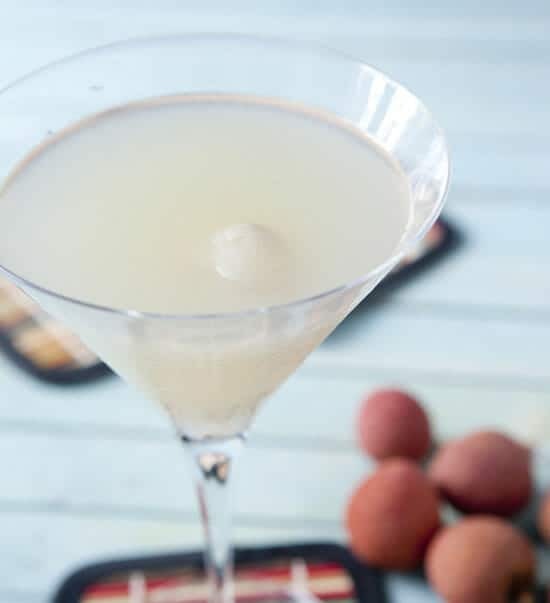 If you can find some lychee fruits, this Lychee Martini is a great way to try them out! 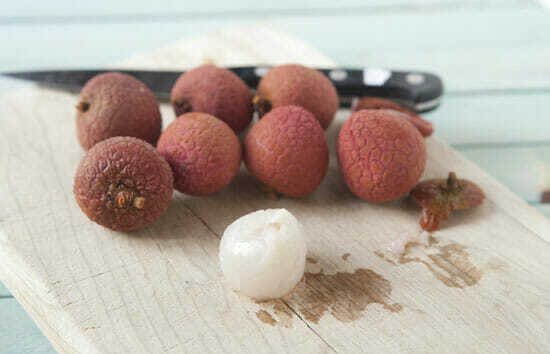 Have you ever tried fresh lychee fruits? Leave a comment! We discovered them in Germany. They tasted delicious and were fun to eat. Chili with Fritoes later made into Frito chili pie: chili over chopped lettuce and onion, then Pace’s picanté sauce, and topped with grated cheese. Hands down favorite is loaded potato skins! Hands down favorite is loaded potato skins. 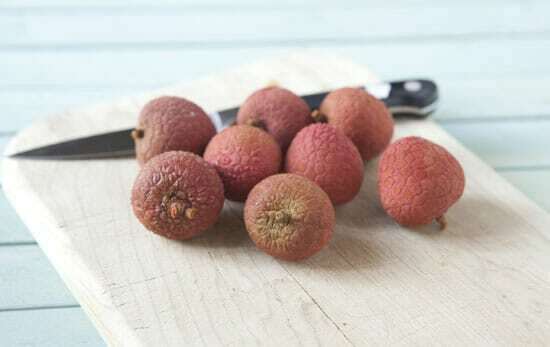 Have you tried can Lychee for this fruit is seasonal. Nick – these look great! I’m actually moving to Denver next week and I was wondering what Asian market you found and where you went for Dim Sum! We actually just went for Dim Sum this weekend in Chicago before we left because I wasn’t sure if there would be good options in Denver. Hey Kara! We went to Star Kitchen for Dim Sum and they were great (Federal and MIssissippi). For the Asian market we went to large supermarket called Pacific Ocean on Alameda. Good luck! 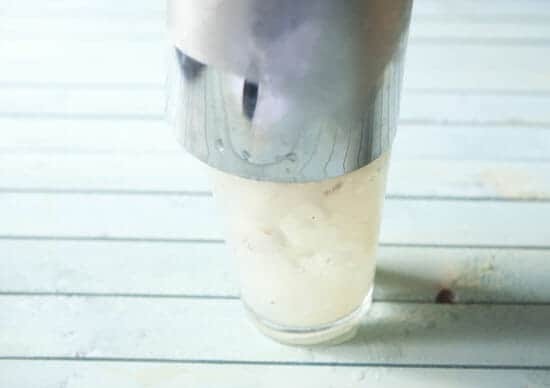 love lychee martinis – I had my first many years ago at a high end indian restaurant in NYC called Tabla (which has closed since 2010).. I’ve recreated it sometimes with this lychee “juice” (real lychee juice thats very sweetened ) that I found at indian grocery stores. Your version looks so fresh! I had lychee martini in a local bar last month and it was so refreshing and yummy. It’s a great drink to have in summer. I never thought about making it at home until I saw your recipe. Thank you for sharing! I love Lychee’s…and really want one of these Martinis! Thanks for the idea. We get litchis for a few months in Mexico from Veracruz and I always make this drink. This is hor th asset way of ” juicing” them. Thanks!